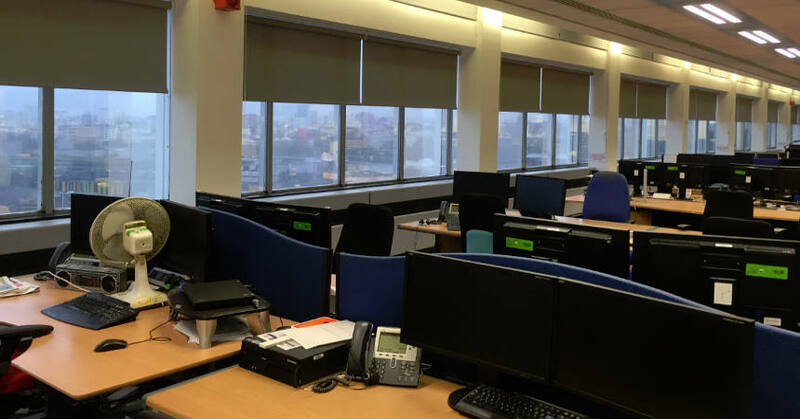 As part of a major refurbishment plan, we were invited to tender for the replacement window blinds for British Telecom at Colombo House in London, from Vinci Facilities. The brief was to bring in a modern window blind to replace the non favoured tatty Vertical blinds currently in the windows with a cleaner look, easily operated and hard working replacement that would work for both lower and high level windows. Using our knowledge we went to work and came up with a solution. We produced a sample blind as a test initially using our Heavy-duty side action roller blind with a Uniview screen fabric. This brings a number of key factors when you have a 24-hour operational office. The system is a hard working 10 year life cycle tested product, modern in its appearance and using a screen fabric allows a link to the outside world as the screen has a 5% openness factor which stops solar gain but with a view through. The sample was agreed and we went forward working with Vinci Facilities installing the commercial blinds a floor at a time during the night and completed almost 450 blinds as part of the project as each floor was refurbished.